8:00 a.m - Finally found time to call the special number Tina, my HP Help Expert gave me. 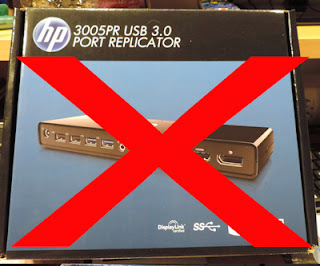 I was hoping to get my HP 690650-001 SPS-Assy USB 3.0 Port Replicator up and running quickly. Oma got to Hugo who told me that I had the wrong department (of course). He does not know why Tina sent me to him. Oma was on hold for 30 minutes then Hugo transferred me to tech support at 800.334.5144. Yup that is the same number I started out with. Shruthi asked me all the same questions regarding the issues I was having. I have answered these question numerous times with numerous people. After Shruthi heard my story, she stated she would have to put me on hold so that she could collect information from the senior technician. I asked to speak to the senior technician personally. Shruthi could not do that however, she was going to put me on hold so that she could get a supervisor. Shruthi promised it would be no longer than a three minute wait. 9:06 a.m. Shruthi asked me to wait a minute. 9:07 a.m. Mathew came on line. He is a Supervisor Case Manager. After hearing the entire story again regarding my HP 690650-001 SPS-Assy USB 3.0 Port Replicator, he placed me on hold so that he could get more information. When he returned, he stated that the replicator would will not the run the laptop power; the laptop power cord would have to be connected to run the laptop. Mathew connected with my laptop to trouble shoot. 9:27 AM You have granted full permission to Technician. To revoke, click the red X on the toolbar or press Pause/Break on the keyboard. 9:27 AM Connected. A support representative will be with you shortly. 9:27 AM Support session established with Shruti. 9:27 AM Remote Control started by Shruti. 9:33 AM Shruti has ended the session. 9:33 AM Remote Control by Shruti stopped. He worked on the settings for the display but made it worse. Now my second monitor had poor quality of display and did not match what we were doing on the laptop. Mathew was not sure why it was doing what it was doing and frankly Oma got scared. After all - Mathew had previously informed me that he was a Case Manager and not a computer tech! 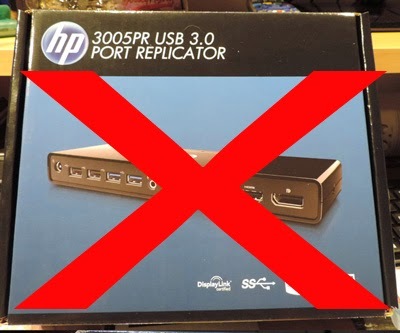 After a discussion with Mathew and Opa - Oma decided that the HP 3005 PR USB 3.0 Port Replicator does not work at all! We are shipping it back today and demanding our money back! It is a shame that Oma could not be reimbursed for all the time wasted on this fiasco!